On Tuesday night, the NFL will announce its Pro Bowl rosters, and many megabucks glory-boy types will hear their names called. 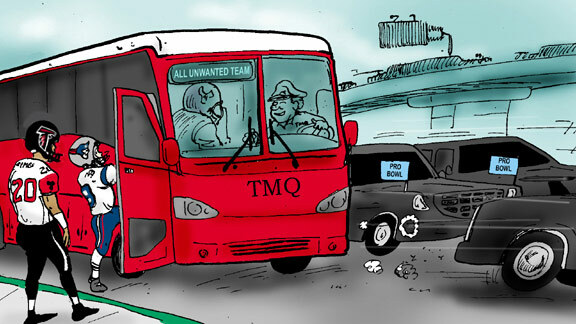 But the players who catch TMQ's eye are the unwanted -- performers who were undrafted, or waived, or both. Thus my annual Tuesday Morning Quarterback All-Unwanted All-Pros. My All-Unwanted roster celebrates those who got where they are based on hard work and determination. In most of life, hard work and determination are more important than social status or God-given talent. That's why Tuesday Morning Quarterback lauds hard work and determination on the part of football players who were not born into success but reached success through constant effort. They set a good example. Consider: This season's NFL leading rusher, Arian Foster, was undrafted, and he has outperformed dozens of high-choice, big-bonus glory boys. This season's NFL sack leader, Cameron Wake, was undrafted and has outperformed dozens of high-choice, big-bonus glory boys. Consider: The Kansas City Chiefs, the NFL's No. 1 rushing team, start four unwanted players on their five-man offensive line -- players who weren't drafted, or were let go by other teams, or both. Mark J. Rebilas/US Presswire Cameron Wake -- undrafted, two years in the CFL, he leads the NFL in sacks. Consider: The New England Patriots, with the league's best record and highest-scoring offense, start seven undrafted players. When undrafted guard Stephen Neal went down injured, undrafted guard Ryan Wendell stepped in to replace him. Ten of the 22 Patriots' starters were undrafted or let go by other teams, or both. And now, the Tuesday Morning Quarterback All-Unwanted Players of the Year. Runner-up. 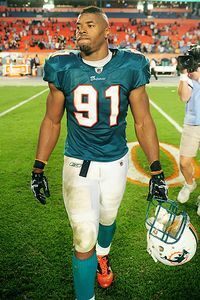 Cameron Wake, linebacker/defensive end, Miami. Undrafted out of college, Wake was waived by the New York Giants, then spent two seasons with the British Columbia Lions. For years, he was ignored by the NFL despite having played prep ball at DeMatha High School, which offers one of the country's very best combinations of athletics and academics, then college ball at Penn State, known to scouts as Linebacker University. Despite setbacks, Wake did not quit. Hard work has made him the 2010 NFL sack leader. Runner-up. Arian Foster, tailback, Houston. Foster was undrafted out of Tennessee and spent most of 2009 on the Houston Texans' practice squad. He did not give up and, through hard work, leads the NFL in rushing. Foster was a philosophy major in college, and his hobby is writing poetry -- showing you don't need to be totally obsessed with sports, ignoring the larger world, to be a good football player. Winners: Brent Grimes, cornerback, Atlanta, and Danny Woodhead, tailback, New England. Will "True Grit" Revive Westerns? Grimes, undrafted out of Division II Shippensburg, quietly has become one of the NFL's best defensive players. In 2006, Grimes was signed and then waived by the Atlanta Falcons, then sent to the Amsterdam Admirals. He started his first game for the Falcons in 2008. This season, he leads Atlanta in interceptions and is the team's No. 2 tackler; it's rare for a cornerback to be a top tackler. Atlanta, at 12-3, holds the inside track for the top NFC seed in no small part because of the performance of an undrafted small-school cornerback whose name many football enthusiasts don't even know. Of course at 5-foot-10, 181 pounds, he's "too small." Woodhead, undrafted out of Division II Chadron State, was born in Nebraska but received no recruiting interest from the University of Nebraska despite a record-setting prep career -- because he is "too small" at 5-8. On the day he left college, Woodhead was the all-time, all-division NCAA rushing leader, but he was not drafted. He spent two seasons with the Jets, mostly on the practice squad, then was waived. This season, he has gained 907 yards rushing and receiving for the Patriots -- his rushing average is 5.6 yards per carry -- and, though "too small," has become one of the NFL's best blitz-blocking backs. Below, find the rest of my All-Unwanted All-Pros. My choices are based on how players actually performed in the 2010 season, not on how much publicity they received. And I'd take my All-Unwanted All-Pros in a game against a regular Pro Bowl squad any day of the week. Luc Leclerc/US Presswire Danny Woodhead -- "too small," the University of Nebraska didn't want him, no NFL team drafted him, all he does is start for the league's best offense. In other football news, this time next week, an NFC West team at either 8-8 (if the Rams) or 7-9 (if the Seahawks) will be in the playoffs hosting an opening-round game. If it's the Seahawks at 7-9, that will be the first time, other than in a strike season, when a losing team made the NFL postseason, and there will be widespread derision. And although a 8-8 or 7-9 team will reach the postseason, the Giants and Bucs at 9-7, or even at 10-6, both are likely to be eliminated while the Ravens could reach 12-4 yet be assigned to open on the road. That the league is entering its final regular-season weekend with a plausible scenario of a 7-9 team hosting a playoff game while a 12-4 team goes on the road is yet another argument that the NFL needs a seeded postseason format. Use divisions and conferences to organize schedules and rivalries. When the postseason arrives, seed the teams 1-12 in order of finish, regardless of conferences. The best and most exciting playoff in sports, the NCAA men's March Madness, is a seeded tournament -- and the result is fantastic game after fantastic game. Using a seeded NFL tournament would mean winning would be rewarded and losing penalized -- isn't this what fans want? The current system rewards luck of the draw in division affiliations. The only possible effect of a seeded format would be ensuring the best teams reach the playoffs! A seeded tournament would in most cases eliminate those awkward late-season games in which teams have locked their best playoff positions and start practice-squad members. If the playoffs were a seeded tournament, even the top teams usually would have incentive to win their final regular-season games. A seeded tournament would eliminate most late-season absurdities, such as Sunday's situation in which the Seattle-Tampa game meant nothing to Seattle. Although the loss dropped the Seahawks to 6-9, the team knew, before kickoff, that it would play for the division title the next week regardless of the outcome. Seattle coach Pete Carroll seemed to call lots of mega-blitzes against Tampa hoping to fall behind quickly so he'd have a respectable reason to pull starters and let them rest. A seeded format would prevent most such nonsense. Most important, a seeded format would ensure better playoff matchups. Isn't this what every NFL viewer and spectator wants? And yes, a seeded format could result in an all-NFC or all-AFC Super Bowl. If the pairing is the two best teams, their conferences shouldn't matter. Do you know, or care, which conference currently leads the NFC-AFC Super Bowl results rivalry? Neither do I.
Stats of the Week No. 1: Going into Sunday's regular-season finale, the New England Patriots can turn the ball over three times -- and still set the NFL record for fewest turnovers in a 16-game season. Stats of the Week No. 2: The San Diego Chargers, ranked first on defense and second on offense, were eliminated from the playoffs. Stats of the Week No. 3: Since taking a 31-10 lead with eight minutes remaining against the Eagles, the New York Giants have been outscored 73-17. Stats of the Week No. 4: After just two starts, quarterback Tim Tebow is the second-leading rusher on the Denver Broncos this season. Stats of the Week No. 5: If Miami wins its season finale at New England -- the Patriots already have locked up the top seeding in the AFC -- the Miami Dolphins will finish 7-1 on the road and 1-7 at home. Stats of the Week No. 6: If the Detroit Lions win their season finale at home against the Minnesota Vikings -- who play on Tuesday night and then again on Sunday -- by 15 or more points, the Lions will finish 6-10 yet outscore their opponents. Stats of the Week No. 7: The New York teams -- the Bills, Giants and Jets -- combined for 15 turnovers. Stats of the Week No. 8 (college stat bonus): The University of Hawaii, playing at home against Tulsa, gained 550 yards on offense -- and lost by 27 points. Stats of the Week No. 9: The New York Jets lost -- and made the playoffs. Stats of the Week No. 10: Tom Brady and Aaron Rodgers have combined for a streak of 39 touchdown passes and one interception. Philadelphi Eagles Jamie of the Eagles -- who perhaps wonders why the Vikings-Eagles game wasn't moved to Bora Bora. Cheerleader of the Week Jamie of the Eagles, who according to her team bio would like to visit either Heidelberg or Bora Bora, and whose favorite quote is from ... G. I. Joe. Sweet Play of the Week: Needing a win to keep alive their postseason hopes, the Indianapolis Colts led the Oakland Raiders 31-26 and had third-and-2 on the Raiders' 31 just inside the two-minute warning. Oakland was out of timeouts, so a first down seals the contest. Peyton Manning ran a naked bootleg -- Manning never does this! -- fooling the entire Raiders' defense. Manning was alone in the left flat and seemed likely to jog to the end zone for a rare rushing touchdown. With the goal line in sight, Manning realized an Oakland defender was gaining on him, and simply slid to the ground at the Raiders' 4; the rest was kneel-downs. Fantasy owners who had Manning surely howled. But this was a smart, smart move. Why risk injury? Slide and end the game. The Cleveland Browns lost to the Baltimore Ravens in part because Mohamed Massaquoi, stood up and, with no hope of advancing, kept churning his legs rather than simply get on the ground; he fumbled, Ravens' ball. When you can't advance -- or, in Manning's situation, don't need to advance -- just get on the ground. As for the Raiders, their fans have long spoken of penalties as if penalties show Oakland plays tough. Penalties show Oakland plays dumb. The Raiders are last in the NFL, with 9.2 penalties per game, and out of the postseason. Sour Coach's Play of the Week No. 1: With Cincinnati leading San Diego 20-13 -- the Bolts needing a victory to stave off elimination despite fabulous stats, Carson Palmer having his best game of the season with the T.Ocho sideshow out of the lineup -- the Bengals faced third-and-7 on their 41 with six minutes remaining. Palmer threw a 59-yard touchdown pass to backup receiver Jerome Simpson, and TMQ wrote the words "season over" for San Diego in his notebook. San Diego corner Antoine Cason was out of position at the snap and burned badly. Sportstalk has analyzed this play all wrong, placing the blame on Cason. Many touts have accused him of a busted coverage; on "Mike & Mike in the Morning," former NFL receiver Cris Carter said Cason must have been "tired" or lost focus. The Chargers' coaching staff was to blame! As Cincinnati approached the line of scrimmage, Bolts defensive coordinator Ron Rivera hadn't called the defense. And the home team was not in a hurry-up -- far from it, with a fourth-quarter lead, Palmer was milking the clock. Rivera did not radio in the defensive call to San Diego green-dot linebacker Kevin Burnett until the Bengals were starting their cadence. At the snap, Cason was looking back at Burnett, trying to get the defensive call. Blame this touchdown on the coaches! And blame the San Diego coaches twice because they weren't paying attention -- with their defense way out of position as Cincinnati was about to snap, coaches should have called timeout (San Diego had all three). From my own modest experience as a middle-school head coach, I can relate that you get 10 seconds, max, to decide on your call because you must allow time for the call to go in and then be relayed to the players. Rivera hadn't made his call quickly enough. Plus, he apparently didn't teach his defense a default call. Quarterbacks typically are coached: If you don't get the call or are confused, run a slant or a draw, staple plays that work from any formation. Middle linebackers typically are coached: If you don't get the call or are confused, then the call is Cover 2, every team's staple defense. The San Diego defense did not seem to have a default call to compensate for the coach's error. Sour Coach's Play of the Week No. 2: With Denver leading 24-23 with 1:19 remaining, Houston had second-and-9 at the Broncos' 39, holding a timeout. The Moo Cows entered the contest with the league's leading rusher; the Broncos entered with the league's last-ranked rush defense; Houston needs a field goal to win. Why not run? Texans' coaches called a pass, interception, game over. Sweet 'N' Sour Play: With Kansas City leading 17-0 against Tennessee, the Flintstones faced third-and-19 -- and the result was a 75-yard touchdown pass to Dwayne Bowe, the signature play of Kansas City's worst-to-first season transition. Sweet. On the play, the Flaming Thumbtacks had seven dropping into coverage to guard four receivers, yet Bowe -- who entered the contest leading the NFL in touchdown receptions -- was running alone. Very sour. After Bowe made the catch around midfield, Tennessee defensive backs Michael Griffin and Cortland Finnegan whiffed on halfhearted tackle attempts, then listlessly jogged after Bowe rather than sprint. Very, very sour. Now Kansas City leads 24-7 with 34 seconds remaining before intermission. Kerry Collins throws an interception to Eric Berry. As Berry takes off toward the Tennessee end zone, all the Titans' speed players simply stand around watching as the offensive linemen try to tackle a speed-merchant safety, whose touchdown effectively iced the game at 31-7. Not only have the Titans collapsed down the stretch but, in this game, they didn't even bother to give effort, making it fair to ask: Is Jeff Fisher giving any effort as coach? 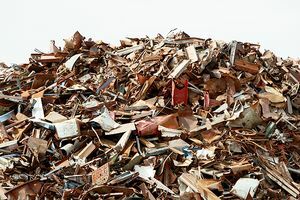 Dave Thompson/Press Association/AP Images "Put down the unwanted scrap metal and keep your hands where I can see them." Freeze! Drop That Discarded Dishwasher or I'll Shoot! The New York Times recently reported that unwanted appliances -- old washing machines and so on -- placed on the curb for disposal in New York City have been "disappearing." With scrap metal prices strong, what the article calls "thieves" have been driving along streets scheduled for used-appliance pickups -- in New York City, this happens by published schedule -- and taking away the unwanted junk before the city's officially approved recycler arrives. The "thieves" then sell the unwanted junk as scrap metal. Set aside whether it's theft to take an unwanted item that has been discarded in a public place. New York City bureaucrats think so; they've instructed police to ticket anyone engaged in recycling without government sanction. Twenty years ago, New York City bureaucrats were demanding that citizens recycle whether they wished to or not, and imposing fines for failure to comply. Now if the average person is caught recycling, it's a police matter. This issue is not the cleanliness of streets or the environmental benefits of recycling -- it's control of money. The New York City Sanitation Department pays a company called Sims Municipal Recycling about $65 million annually to pick up and recycle metal, glass and aluminum. Notice what's happening here? Recycling is supposed to make economic sense. If it did, the recycling company would be paying the city. Instead, the city is paying the company. Montgomery County, Md., my home county, imposed recycling rules saying they made economic sense. Now the county charges homeowners $210 annually as a recycling tax. If recycling made economic sense, government would pay homeowners for the privilege of picking up their valuable materials. Instead, New York City, Montgomery County and many other government bodies charge citizens for something they claim makes economic sense. Recycling of aluminum makes good economic sense, given the energy cost of aluminum and the high quality of recycled aluminum. Depending where you are in the country, recycling of newspapers might make sense. Recycling of steel and cooper usually makes sense. But recycling of glass, most plastics and coated paper is a net waste of energy. Often the goal of government-imposed recycling program is to use lack of understanding of economics to reach into citizens' pockets and forcibly extract money that bureaucrats can control. Notice what else is happening here -- New York City pays a company millions of dollars to do something "thieves" will do for free. The "thieves" harm no one, and could save New York City taxpayers considerable money. But then bureaucrats wouldn't be in control. And surely no-show jobs and kickbacks have nothing, absolutely nothing, to do with New York City sanitation contracts. Crabtree Curse Series Finale: Mike Singletary -- fourth head coach fired in 2010 before season's end -- finished 8-5 without Michael Crabtree and 10-17 with him. Singletary mainly seems an example of a common NFL phenomenon, the guy who's qualified to be a coordinator but in over his head when in charge of the whole team. Having a shouting match with quarterback Troy Smith on the sideline in St. Louis, when the game was close with the postseason on the line, seems evidence of Singletary being in over his head, as was the tally of five quarterback changes Singletary ordered this season. TMQ noted several times this season that the Squared Sevens appeared "uncoached." But let's not forget the Crabtree Curse, which TMQ sees as all too real. In 2008, Singletary fought to make his players buy into the notion that no one is bigger than the team. It worked, and San Francisco began to win. Then the 49ers used a high first-round draft choice on me-first Crabtree, watched him stage a prolonged holdout, then rewarded him with a $15 million bonus for going me-first. So much for the team commitment business. Sunday, the Niners had lazy play after lazy play. In the first quarter, Smith was sacked in his end zone for a safety, putting Les Mouflons ahead 9-0, though San Francisco had six linemen to block four rushers. On the down, tackle Anthony Davis, a high first-round pick, simply brushed his man then turned around to watch the sack, making no attempt to block; two other San Francisco linemen also stood around watching. On another down, Davis barely slowed Rams defensive end Chris Long with an "olé" block, then turned to watch Long get the sack. Trailing 15-14 at the start of the fourth quarter, San Francisco coaches called a pass on third-and-1. Although the Niners had six to block four, tailback Brian Westbrook was the sole San Francisco player to attempt to block much larger defensive end James Hall: sack, punt. "Uncoached" is the word that came to mind as I watched the 49ers stumble anew. As for the Rams -- their home crowd has forgotten what it means to be in late playoff contention, booing loudly after both San Francisco touchdowns. Way to support your team! 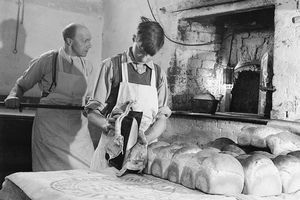 John Chillingworth/Picture Post/Getty Images Bread didn't used to come with lengthy legal disclaimers. Disclaimer of the Week TMQ likes the Panera bakery-café chain, which makes great stuff, devotes a lot of energy to just-baked breads -- the delicious norm in Europe, rare in the United States -- and scores well in restaurant healthfulness guides. Last week, I registered for a Panera affinity card, which offers treats such as free cookies. Required was clicking "I accept" to a 1,679-word disclaimer that, surely, the company hopes no one will read. Included in the fine print: "In the event that Panera, its affiliates, our/their franchisees, and/or suppliers are found liable to you for any reason, you shall only be entitled to recover actual and direct damages and such damages shall not exceed $100." So by signing up for a free cookie, you agree that if you receive tainted food or are somehow injured at one of the cafes, your maximum damages are $100. Such legal boilerplate often lacks meaning -- in most cases, a business entity can't disclaim liability. But boilerplate sometimes works to scare away the legally unsophisticated. A 1,679-word disclaimer for a bakery? Monday Night Football Analysis: The winning play for New Orleans on Monday night -- a bang slant to a tight end split wide right near the goal line -- was the same action the Saints employed to take the lead in the fourth quarter of the Super Bowl. The nifty variation was that the Saints lined up trips left then sent a man in motion left to make it quirk left, drawing attention to the overloaded side. (Trips comes from triple; TMQ maintains that four receivers on the same side should be called the quirk, for quad.) Buffalo tried the same play near the goal line on its opening drive Sunday against New England; Sean Payton might even have gotten the play from that game. But the Bills being the Bills, the pass to the lone guy clanged incomplete; the Saints being the Saints, the pass to the lone guy was the winning touchdown. Last season, the New Orleans defense looked average during the year, then, in the playoffs, handled Kurt Warner, Brett Favre and Peyton Manning in successive games. This season, the New Orleans defense has looked average, then Monday night, shut down the NFC's leading team at home -- just 215 offensive yards allowed. Is the New Orleans defensive switch being thrown into the "on" position like at this time a year ago? The tastefully named Gregg Williams, defensive coordinator of New Orleans, even had his charges in a 46-like front when Atlanta reached first-and-goal, something the Saints hadn't shown, and an unpleasant surprise to the Falcons, who lost a fumble. Atlanta has been winning without flashy stats on offense or defense. The Falcons play smart and disciplined, leading the league with fewest penalties -- just one on Monday night -- and winning close games. Their one distinctive trait is passing on first down, which Atlanta does more than any other NFL team. Most NFL clubs rush on first down, when the defense is stacked against the rush, then throw on second and third downs, when the defense is in a nickel. Brian Burke of Advanced NFL Stats argues that it makes sense to throw on first down against a rush defense. The Falcons have faced stacked rush defenses all season and have responded by throwing on first down. Monday night, New Orleans often had nine defenders on the line on first down. Atlanta coaches called rushes on 12 first downs, for a net of 23 yards; called passes on 11 first downs, for a net of 108 yards, counting scrambles and defensive pass interference. By the second half, why didn't Atlanta coaches realize passes on first down were working much better than rushes? After New Orleans took its late lead at 17-14, Falcons coach Mike Smith made the fateful blunder of punting on fourth-and-6 from his 43 with 2:52 remaining -- Atlanta never saw the ball again. Most NFL coaches would do the conservative thing and punt in this situation. And most NFL coaches who did that would end up losing the game, as happened to Smith. The Falcons and Saints split their meetings this season with a combined final score of 41-41. If they meet again in the playoffs, expect the contest to be close. The 2010 All-Unwanted All-Pros: Here are the qualifications for the All-Unwanted All-Pros: A player must have been undrafted, or been waived, or been let go in free agency when his original club made no bona fide attempt to retain him. Players who left their teams via trade are not eligible because the team received something of value in return. Free agents whom their original teams wanted to retain, but could not for salary-cap reasons, are not eligible. It is possible to be both wanted and unwanted. For example, Wes Welker qualifies as unwanted for going undrafted, then being waived by San Diego. But his trade from Miami to New England does not count because the Dolphins got draft choices in return. An asterisk means unwanted more than once. 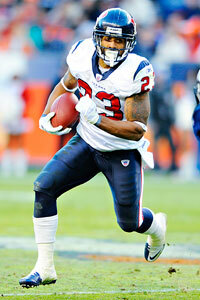 Ron Chenoy/US Presswire Arian Foster of Houston -- undrafted, he leads the NFL in rushing. And in college, he went to class! Offensive line: Tyson Clabo*, Atlanta (undrafted, waived by Broncos, Giants and Chargers); Kris Dielman, San Diego (undrafted, and had never played offensive line, in high school or college, before the NFL); Donald Penn*, Tampa (undrafted, waived by Minnesota); Ryan Lilja*, Kansas City (not recruited out of high school, undrafted, waived by Indianapolis after starting in the Super Bowl); Jeff Saturday*, Indianapolis (undrafted, cut by the Ravens, future Hall of Fame entrant and the 2007 Tuesday Morning Quarterback Non-Quarterback Non-Running Back NFL MVP). Wide receivers: Brandon Lloyd*, Denver (waived by Washington and Chicago, started only seven games from 2007 to 2009, leads NFL in receiving yards); Wes Welker*, (undrafted, waived by San Diego, not recruited out of high school despite scoring 83 prep touchdowns, not drafted despite an NCAA-record eight punt return touchdowns in college; 2008 Unwanted Player of the Year). Fullback: BenJarvus Green-Ellis*, New England (undrafted, waived once by his own team). Running backs: Arian Foster, Houston (undrafted, leading NFL in rushing; undrafted Priest Holmes led the NFL in rushing in 2001); Fred Jackson*, Buffalo (undrafted out of Division III Coe College, played for the Sioux City Bandits). Quarterback: Michael Vick, Philadelphia (waived by Atlanta; when released from prison, most NFL teams would not even talk to him). Kim Klement/US Presswire Brent Grimes of Atlanta -- "too small," undrafted from a Division II college ... and one of the NFL's best players. Defensive line: Cameron Wake, Miami (undrafted); Antonio Garay*, San Diego (waived by the Browns, Bears and Jets); Jacques Cesaire, San Diego (undrafted out of Division II Southern Connecticut State); Cullen Jenkins, Green Bay (undrafted). Linebackers: James Harrison*, Pittsburgh (undrafted, played for the Rhein Fire, cut by Ravens and once cut by the Steelers -- 2009 Tuesday Morning Quarterback Non-Quarterback Non-Running Back NFL MVP); Gary Guyton, New England (undrafted); Stephen Cooper, San Diego (undrafted out of Division I-AA Maine). Defensive backs: Brent Grimes, Atlanta (undrafted); Jim Leonhard*, Jersey/B (undrafted after being a college walk-on, let go by Buffalo and Baltimore, 2009 TMQ Unwanted Player of the Year); Jacob Lacey, Indianapolis (undrafted because he is "too small," was an econ major in college); Jabari Greer, New Orleans (undrafted). Offensive line: Jonathan Goodwin, New Orleans (let go by Jets); Kyle Cook*, Cincinnati (undrafted, waived by the Vikings); Flozell Adams, Pittsburgh (waived by the Cowboys; since that moment, the Cowboys have been losing and the Steelers winning); Ryan O'Callaghan, Kansas City (waived by New England); Brian Waters, Kansas City (undrafted, decent chance of making Hall of Fame). Wide receivers: Miles Austin (undrafted out of Division I-AA Monmouth); Mike Williams*, Seattle (former higher first-round pick was waived by Detroit, Oakland and Tennessee, was out of football in 2008 and 2009). Tight end: Ben Watson & Evan Moore*, Cleveland (Moore was undrafted and waived twice, has a master's in sociology from Stanford; Watson was let go by New England -- combined, they form one of the NFL's top pairs of tight ends). Fullback: John Kuhn, fullback, Green Bay (undrafted out of Division II Shippensburg). Running backs: LeGarrett Blount, running back, Tampa (undrafted in 2010, has outgained 2010 first-round-drafted running backs C.J. Spiller and Jahvid Best combined); Danny Woodhead*, New England (undrafted out of Division II Chadron State, waived by Jets). Quarterback: Drew Brees, New Orleans (let go by San Diego, rejected by Miami when he offered to sign there because "too short," has won the Super Bowl and is on track for numerous passing records). Mike Wright, New England (undrafted, started at Division II Ashland University); Jeremy Mincey*, Jacksonville (waived by New England and San Francisco, beat out Derrick Harvey, eighth selection of the 2008 draft); Israel Idonije*, Chicago (undrafted out of the University of Manitoba, waived by Cleveland, had three sacks in one game this season); Brain Schaefering*, Cleveland (undrafted out of NAIA Lindenwood, waived by the Jets). Linebackers: Gary Brackett, Indianapolis (undrafted, among the league's top defensive players); Dhani Jones*, Cincinnati (let go by the Eagles and Saints, graduate of TMQ's kids' high school; David Bowens*, Cleveland (waived by Denver, Green Bay, Buffalo, Washington, Miami and Jersey/B; had two interceptions against Drew Brees this October). Defensive backs: Kyle Arrington*, New England (undrafted out of Hofstra, which no longer has a football program, waived by Eagles and Bucs); Tramon Williams, Green Bay (undrafted); Charles Woodson, Green Bay (future Hall of Famer cast off by Oakland as "washed up" five years ago); Chris Carr*, Baltimore (undrafted, cut by Oakland and Tennessee). Place-kicker: Billy Cundiff*, Baltimore (undrafted out of Division I-AA Drake, has been cut eight times, high even by the standards of place-kickers. In 2010, he has missed only three field goal attempts and been the league's top kickoff man with 38 touchbacks, a stat little appreciated by sportscasters and spectators but essential to field position. The NFL record for a 16-game season is 40). Punter: Mat McBriar*, Dallas (undrafted, waived by Seattle and Denver, leads league in net average). 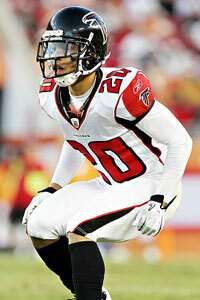 Returner: Eric Weems, Atlanta (undrafted out of Division I-AA Bethune-Cookman, runs back both kickoffs and punts). 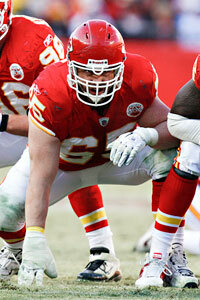 Special-teamer: Andy Studebaker, Kansas City (waived by Eagles, attended college at Division III Wheaton of Illinois). Place-kicker: Matt Bryant*, Atlanta (undrafted, played for the Iowa Barnstormers, Frankfurt Galaxy and Florida Tuskers, waived by the Giants, Colts, Dolphins and Buccaneers; 27-of-30 of field goals this season). Punter: Chris Kluwe*, Minnesota (undrafted, waived by Seattle, excellent mix of net average and punts downed inside the 20). Returner: Dan Connolly, New England (undrafted, also starts for the Patriots at guard). Special-teamer: Jo-Lonn Dunbar, New Orleans (undrafted). Lorenzo Alexander, linebacker, Washington (undrafted, has played linebacker, defensive tackle, defensive end, tight end and fullback for Redskins). Danny Amendola,* slash, St. Louis (undrafted, waived twice, leads the NFL in all-purpose yards). Antwan Applewhite*, linebacker, San Diego (undrafted, waived once by Chargers). Anthony Armstrong, wide receiver, Washington (undrafted out of Division II West Texas). Remi Ayodele*, defensive tackle, New Orleans (undrafted, cut by Dallas, Atlanta, Baltimore and New England). Jason Babin*, defensive end, Tennessee (waived by Texans, Seahawks, Chiefs and Eagles). Brandon Banks, kick returner, Washington (undrafted despite 10 kick return touchdowns in college because he was "too small," returned one kick for a touchdown and had another called back as a 2010 NFL rookie). Jovan Belcher, linebacker, Kansas City (undrafted out of Division I-AA Maine). Davone Bess, wide receiver, Miami (undrafted). Mike Brisiel, guard, Houston (undrafted). Tony Brown*, defensive tackle, Tennessee (undrafted, cut by Carolina, Miami and San Francisco). AP Photo/Ed Zurga Ryan Lilja: undrafted, waived by the Colts ... and one of the league's best linemen. Melvin Bullitt, safety, Indianapolis (undrafted, played four positions in college). Josh Cribbs, Cleveland, slash (undrafted despite being the all-time yardage leader at Kent State; has caught, thrown, rushed and returned kicks for the Browns this season). Kyle DeVan*, guard, Indianapolis (undrafted, waived by the Redskins and Jets, played for the Boise Burn of ArenaFootball2). Abram Elam*, safety, Cleveland (undrafted, waived by Miami and Dallas). London Fletcher*, linebacker, Washington (undrafted out of Division III John Carroll, waived by two teams, in decline but still making his case for the Hall of Fame, career stats very similar to those of Ray Lewis). Ramon Foster, guard, Pittsburgh (undrafted, was a place-kicker in high school). Aaron Francisco*, safety, Indianapolis (undrafted, waived by three teams). Aubrayo Franklin, defensive tackle, San Francisco (let go by Baltimore). Wallace Gilberry and Shaun Smith*, defensive ends, Kansas City (both undrafted, have taken turns starting ahead of Tyson Jackson, third overall choice of 2009 draft. Smith was waived by the Cowboys, Cardinals, Saints, Bengals, Browns, Lions and Las Vegas Locomotives). Kelly Gregg*, defensive tackle, Baltimore (tastefully named, waived by the Bengals and Eagles, Gregg is the second-leading tackler in Ravens' history). Anthony Hargrove*, defensive tackle, New Orleans (cut by the Rams and Bills, did not play in 2008). Will Heller*, tight end, Detroit (cut four times, including twice by Tampa. Jason Hill, wide receiver, Jacksonville (waived by San Francisco. Renaldo Hill*, safety, Denver (cut by Arizona, Oakland and Miami). Chris Ivory, running back, New Orleans (undrafted out of Division II Tiffin). Antonio Johnson, defensive tackle, Indianapolis (let go by Tennessee). Donald Jones and David Nelson, wide receivers, Buffalo (both undrafted, Jones out of Division I-AA Youngtown). Thomas Jones*, running back, Kansas City (released by Arizona and Jersey/B, needs 121 yards in regular-season finale to record his sixth consecutive 1,000-yard rushing season). Tommy Kelly, defensive tackle, Oakland (undrafted). Bryan McCann, cornerback, Dallas (undrafted, scored two length-of-field touchdowns in 2010). Quintin Mikell, safety, Philadelphia (undrafted). Brandon Moore, guard, Jersey/B (undrafted). AP Photo/Ross D. Franklin The Arizona cheer-babes danced on Christmas night, for a game watched on television by maybe 11 people. Lance Moore, wide receiver, New Orleans (undrafted). Daniel Muir*, defensive tackle, Indianapolis (undrafted, waived by Green Bay). Stephen Neal, guard, New England (undrafted, did not play football in college). Rob Ninkovich*, linebacker, New England (cut by the Saints and Dolphins). Ogemdi Nwagbou*, defensive tackle, San Diego (undrafted, waived by Giants, spent 2008 out of football, working as a clerk in a rental-car agency). Juqua Parker, defensive end, Philadelphia (undrafted, let go by Tennessee). Charlie Peprah, safety, Green Bay (waived by Giants and Falcons). Mike Peterson*, linebacker, Atlanta (let go by Indianapolis and Jacksonville). Bernard Pollard, safety, Houston (cut by Kansas City, plays well though Texans' secondary is awful). Marcel Reece*, fullback, Oakland (undrafted, waived by Miami). Lyle Sendlein, center, Arizona (undrafted). Gerald Sensabaugh, safety, Dallas (released by Jacksonville). Rich Seubert, center, Giants (undrafted out of Division I-AA Western Illinois). Sam Shields, cornerback, Green Bay (undrafted, was a wide receiver in college). Michael Spurlock*, wide receiver, Tampa (undrafted, waived four times including by the Florida Tuskers). Pierre Thomas, running back, New Orleans (undrafted, played well in the Super Bowl). Mike Tolbert, fullback, San Diego (undrafted out of Division I-AA Coastal Carolina). Ryan Torain, running back, Washington (cut by Denver, was out of football in 2009). Nate Washington*, wide receiver, Tennessee (undrafted from Division II Tiffin, let go by Pittsburgh). Blair White, wide receiver, Indianapolis (undrafted). Pat Williams*, defensive tackle, Minnesota (undrafted, let go by Buffalo as "washed up" six years ago, three Pro Bowl appearances since). George Wilson*, safety, Buffalo (undrafted, waived by Detroit, played the boyfriend of Mary J. Blige in a music video). Will Witherspoon*, linebacker, Tennessee (let go by Carolina, St. Louis and Philadelphia, one of the few Titans to have a good season). Buena Vista Pictures Kurt Russell, in "Tombstone," was determined to hunt down and kill any lingering good feelings about Wyatt Earp. Gunfight at the Hollywood Corral: The remake of "True Grit" is getting good reviews. It's well-made, has a sense of humor and shifts the focus of the story from the John Wayne character onto the 14-year-old girl, this time played by tween actress Hailee Steinfeld. Hollywood went through a long phase of celebratory Westerns that papered over the problems of settling the West, then a phase of nihilistic Westerns that portrayed the Wild West as hell. Neither view was correct. Historian Patricia Limerick of the University of Colorado has shown in convincing detail that Native Americans were severely mistreated during the Wild West phase but that gunfighting was rare and two guys facing each other to draw in the middle of a street might never have happened at all. In recent years, Hollywood has seemed to give up on Westerns. Maybe the "True Grit" remake will revive the form. • "My Darling Clementine," 1946. Henry Fonda plays Earp as a paragon of virtue; the perfect man. • "Gunfight at the O.K. Corral," 1957. Burt Lancaster plays Earp as a hero whose morality wavers under pressure. • "Hour of the Gun," 1967. James Garner plays Earp as a decent man who risks his soul when a corrupt system drives him to become judge, jury and executioner. 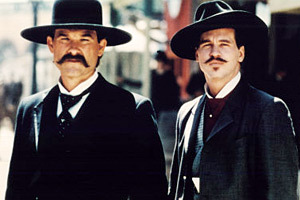 • "Tombstone, "1993. Kurt Russell plays Earp as a calculating killer who's difficult to distinguish from those he pursues. As Earp's stature declines through these movies, Doc Holliday, a drunken misogynist, becomes steadily more likable: by "Hour of the Gun," Doc (Jason Robards in that flick) gets the good lines and the audience sympathy. Through the movies, Ike Clanton progresses from a mindless goon to a smooth-talking organized crime boss, then to a crooked politician little different from all the other crooked politicians. Clanton's changing portrayal in the Earp movies is itself a barometer of changing social attitudes. There's one other big-budget sort-of-Earp movie, "Sunset," a 1988 Blake Edwards comedy loosely based on the actual Earp's late-life experience with the nascent industry of talkies. Garner again plays Earp, this time as an irresistible ladies' man who effortlessly rights a few wrongs. "Sunset" isn't a great film, and it tells you something about Hollywood glorification of violence that by 1988, even a comedy could have a subplot about a wealthy studio boss and his lesbian sister who like to torture attractive young women to death. A comedy! Still, this flick is worth renting. It was Bruce Willis' first star-billed role, and the film's final image -- of a cowboy who bucks his horse in salute as a steam train disappears into the endless prairie -- is the best Wild-West romanticism in all Hollywood annals. The More the Merrier: With the crazed 16-game Texas high school football season finally over, here is this year's high school title count: the United States crowned 362 state high school football champions in 2010. Texas led the way with 24 state champions -- "We won the 2A II division!" -- which represents one state football champion per million residents. Massachusetts crowned 20 high school football champions -- "We won the E-IIIA division!" -- a ratio of one state champion per 330,000 residents. New Jersey had 19 high school football champions -- "We won North Group 2 Division IV!" -- a ratio of one state champion to 460,000 residents. California had only four state champions, one per nine million residents, but the Golden State also crowns champions of what are essentially regional tournaments. And Wyoming had five state high school football champions, one per 110,000 residents. 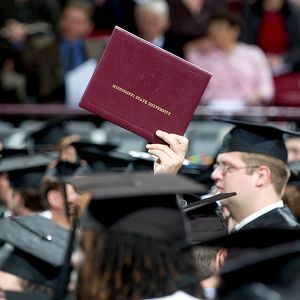 AP Photo/Mississippi State University/Megan Bean So what if you haven't actually gotten the diploma -- how's about a donation to the college? Unified Field Theory of Creep: Laura Wooldridge of Phoenix writes, "I graduated from college last May and before I knew it, the alumni association contacted me to ask for a donation. The request for a donation came before I received my diploma." Dan Youngblut of Redmond, Wash., writes, "Amazon will already let you pre-order the next BioShock video game, BioShock Infinite, though the game's very tentative release date is Dec. 31, 2012." Michael Kessler of Chicago reports that the issue of GQ he received on Dec. 15 features a spring style guide. Steve Chaggaris of Washington, D.C., reports, "On Dec. 21, the winter solstice, I received a Land's End catalog boldly headlined, "Winter's End Sale." Dec. 21 is winter's beginning." How Bad Are the Bills? In the NFL, the test of manhood is games within your division: by this measure, Buffalo, which has lost 15 straight against New England, and 20 of the past 21, should swap names with its cheer squad and call itself the Buffalo Jills. Among the many spectacular stats the Flying Elvii have posted this season is a plus-27 mark on turnovers. Another is that they have reached first-and-goal inside the 5 on 14 occasions and scored touchdowns all 14 times. One reason is constant variation of play calling rather than running the same plays over and over, as many NFL teams do. Trailing 3-0, New England had second-and-2 on the Buffalo 29. The Patriots ran a delayed draw to Danny Woodhead, with the center and right guard double-teaming Bills nose tackle Kyle Williams while tight end Rob Gronkowski trap-blocked confused rookie defensive lineman Terrell Troup. Usually, only guards trap-block; at New England, tight ends do. Touchdown for Woodhead. Now leading 10-3, the Patriots had second-and-7 on the Buffalo 8. New England lined up in a power-I backfield with an extra tight end as the fullback; Wes Welker went in motion wide right, drawing the defenders on that side; Tom Brady play-faked a power rush left; Gronkowski, lined up as the tight end right, faked a block, then ran into the right flat uncovered, touchdown reception. There was a lot going on in this play -- first a diversion right, then a diversion left, then a pass right. Constant variation has helped New England be the league's highest-scoring offense. Gift Strategy for the Holidays 2011: On Christmas Eve, The Wall Street Journal advised readers to give chocolates or wine for the holidays because they will be consumed and "won't contribute to your recipient's household clutter. Laura Leist, president of the National Association of Professional Organizers, says dealing with extraneous gifts is one of her clients' biggest organizing challenges. 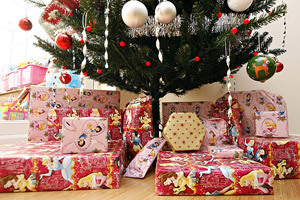 People often don't have the space to store gift items but feel too guilty to give them away." AP Photo Half as many would be twice as good! This statement threw me for a loop on several levels. The minor level is economic. Economists maintain that cash is the ideal gift because it causes no waste, of resources or of money value. If I spend $50 to give you a battery-powered nose massager, and to you that gift merely becomes clutter in the back of the closet, $50 has been wasted. If I give you $50 cash, you will spend it on something you value as worth $50. What hit me over the head, though, was that in a nation where one person in eight lives in poverty -- in a world where 900 million people live on $1.25 or less a day -- "dealing with extraneous gifts" is such a problem for many Americans that a trade association exists to help them cope with this dreadful burden. While many suffer, others complain of receiving gifts they lack room to store. This is deeply messed up. Practically everyone believes Christmas has become excessively materialistic -- too much focus on piles of junk recipients don't even want, much less need, coupled with (for Christians) hardly any mention of the original spiritual significance of the day and (for those who celebrate secular Christmas) hardly any mention of the less fortunate. Cash gifts solve the economic objection, but flunk on sentimental value. If family gift giving consisted of everyone exchanging boxes containing $50, economic efficiency would rise but the gift ritual would seem a waste of time. So here is TMQ's suggestion for the 2011 holidays -- give the gift of receipts for charitable donations. Give money in your recipient's name to any charity, school or arts organization. Wrap the receipt in pretty foil paper. You're not wasting dollars on some hunk of junk your aunt doesn't even want; you are doing something good for the world. You can feel good, and the gift recipient can feel good. FOX Actress Anna Torv would be welcome in any universe. Sci-Fi Line of the Year: "I don't feel at home here. I'm from another universe" -- actress Anna Torv on Fox's "Fringe." Runner-up, from the same series, spoken by an exasperated police officer: "When we get missing children complaints, 99 percent of the time they turn out to be routine domestic disputes that have nothing to do with any alternative universe." Jersey/B Breakdown: Talk, talk, talk -- the Jets sure can talk. Rex Ryan was yukking it up in the postgame news conference after Jersey/B, which has lost three of its past four, backed into the postseason in defeat. They should serve drinks and have a band at Jets postgame news conferences! It's a party no matter what happens on the field. A week after Jersey/A special-teams coaches made awful calls, Jersey/B special-teams coach Mike Westhoff called the worst-designed fake punt in football history. With the Jets leading 24-17 early in the third quarter, facing fourth-and-3 on their 40, in came the punt unit -- but quarterback Mark Sanchez stayed on the field. Gee, what could that mean? Nobody was fooled -- Devin Hester, the return man, began yelling "fake! fake!" as the Jets came toward the line, and he ran up to play defense. The pass fell incomplete, and Chicago scored a touchdown on the next snap. This was the pivotal moment of the contest. Not only did Jets coaches send in the worst-designed fake punt in football history but -- when it became obvious Chicago knew the play was a fake -- Jets coaches did not call timeout. Then, with Jersey/B trailing 38-34 with six minutes remaining, Ryan punted from the Chicago 35! Who cares if it was fourth-and-6, who cares if a fourth-down attempt failed earlier; trailing late in the game, it makes no sense to punt from the opposition's 35! But these Jets, man can they talk. Last season, Jersey/B cornerback Darrelle Revis was one of the league's top performers. But since he was rewarded with a big bonus check for skipping much of training camp, Revis seems to be celebrating by taking the 2010 season off. On Sunday, he basically stepped out of the way of the Bears' Matt Forte at the 3-yard line as Forte scored a touchdown. Later, Revis was singed for a touchdown catch by Johnny Knox of Division II Abilene Christian. Last season, Revis styled himself as Revis Island; this season, he looks like Revis Yacht Marina. Meanwhile, in cold weather, rain or snow in the NFL, California beach bum Sanchez has thrown five touchdown passes and 18 interceptions. Not a good sign for an AFC East club. Time Inc. Time magazine's everything-is-bad summary of the decade. Only Bad News Counts as News: Time magazine published a year-end issue whose cover was a montage of important events of the decade. 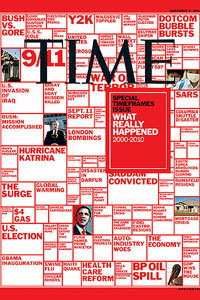 Some 118 happenings were chosen by Time editors as the most important in the decade. Four were positive (sports achievements, an African-American inaugurated as president). Fourteen were neither good nor bad ("Pluto demoted to dwarf planet"). One was goofy ("AOL-Time Warner merger" was named by Time as among the world's most important events of the decade). One made you want to weep for the state of American culture ("'The Dark Knight' release" is treated as more important than any book, work of art or music). The rest, 98 of 118 events cited, were negative. Really? Eighty-three percent of what happened in the past decade was negative? The Time selection says nothing about major positive trends such as declining international military spending (rising U.S. spending is the exception to the rule), declining teen pregnancy rates, declining crime, declining accidental deaths. "U.K. foot and mouth crisis" -- which harmed only livestock -- was cited, but nothing was said about declining cancer rates. "Shark attack" was cited, but nothing was said about the dramatic rise in living standards in most of the developing world. ("Overall, poor countries are catching up with rich countries" on nearly all central measures, according to this important new report.) Yes, journalists have always loved bad news, and have long pretended good news doesn't exist. But this is ridiculous. Jersey/A Breakdown: "We're never out of position," Giants' safety Kenny Phillips was quoted as boasting in a New York Times article, one lavishly lauding the Jersey/A secondary, published the morning before the Giants' epic collapse versus the Eagles. Since that article appeared, the Jersey/A secondary repeatedly has been out of position, blowing coverages in the Philadelphia comeback and blowing coverages Sunday at Green Bay. Surely the football gods chortled. On the Packers' 80-yard touchdown pass to Jordy Nelson, Jersey/A had three safeties on the field -- the G-Men have been playing a TCU-style 4-2-5 much of the season -- and all three were out of position as Aaron Rodgers play-faked and Nelson ran a post. When the other team's possession receiver can get behind three safeties, that's awful defense. Safety Deon Grant was way out of position on the 24-yard, fourth-quarter completion that set up the touchdown that put the game out of reach. Michael Vick's comeback the previous week was enabled largely by too much Jersey/A blitzing. So, did Giants coaches learn their lesson? With Green Bay leading 24-17 in the second half, the Giants blitzed six; the result was a 36-yard completion to Greg Jennings to set up a touchdown. The football? Those Giants, minus-six on the season in turnover margin, sure do like to wave it around. Jersey/A still had hope, down 31-17 in the third quarter, but Brandon Jacobs carelessly lost the football at the end of a long gain into Green Bay territory. Then, instead of simply falling on the ball as players are taught since middle school, Kevin Boss of the Giants tried to pick it up; the outcome was a Green Bay recovery, aided by Packers linebacker Desmond Bishop, about to fall out of bounds, alertly batting the ball back to a teammate. 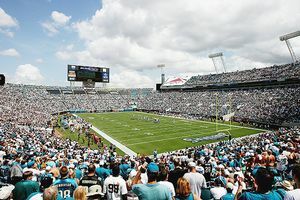 Doug Benc/Getty Images Finally, the Jaguars drew a big crowd, like they used to! But for loss to the hapless Redskins. The Football Gods Chortled Anew: On Sunday morning, Football Outsiders reported that Jacksonville Jaguars QB David Garrard had the league's best passer rating from the start of the fourth quarter on. On Sunday afternoon, on the first possession of overtime, Garrard threw a cover-your-eyes awful pass -- falling backward under tackle -- for the interception that positioned Washington for the winning field goal. The Jaguars' situation is not quite as bad as the Broncos' in 2008 -- having a four-game lead with four games to play and missing the postseason. But two weeks ago, Jacksonville needed one win for the playoffs and now has lost two straight, including a woofer performance at home to the hapless Washington Redskins. All those sold-out home dates this season might end up down the drain unless the Indianapolis Colts honk at home next week against the hapless Tennessee Titans. Not only did the Jaguars play poorly but, once overtime was reached, Jacksonville would have been slightly better off with a tie than it would be with a defeat. Yet, with third-and-4 on the Jax 17 in overtime, Jaguars coaches called a risky pass that led to the interception rather than run against Washington, which is ranked last in the NFL in total defense. AP Photo/Phelan M. Ebenhack Donovan McNabb struggles to survive the brutal, life-threatening conditions in Florida. The weather was nippy in Florida -- kickoff temperature 38 degrees -- yet it's absurd to see many Jaguars starters, including Eugene Monroe and Mike Thomas, wearing balaclavas as if braving a blizzard. The temperature was above freezing! Back in the day, when the Vikings played outside, Bud Grant -- who allowed heaters for the visitors' sideline but not for the Minnesota sideline -- used to say, "If you are afraid of the cold, you are already beaten." Jacksonville dressed for the game as if afraid of the cold -- in Florida! 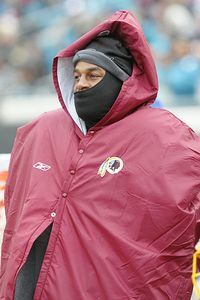 On the Washington sideline, Donovan McNabb wore a balaclava pulled over his face, a ski cap and a heavy parka as if preparing to ascend K2. The temperature was above freezing! Buck-Buck-Brawckkkkkkk: Carolina, at 2-12 the league's worst team, reached the Steelers' 32 on its first possession -- and punted. Who cares if it was fourth-and-5? Who cares if it was fourth-and-32? A 2-12 team punts from the opposition's 32? The Panthers might as well have run up the white flag right there and left to get blueberry-almond martinis. The punt boomed into the end zone for a net of 12 yards in field position, and I don't even need to tell you who won the game. Hidden Play of the Week: Hidden plays are ones that never make highlight reels but that stop or sustain drives. With Indianapolis needing a win to keep alive its playoff hopes, the Colts, at Oakland, led 24-16 at the start of the fourth quarter. The Raiders faced third-and-9 on the Lucky Charms' 19. Indianapolis rushed five, and middle linebacker Gary Brackett got a sack, forcing the home team to settle for the field goal. The contest ended with Indianapolis winning 31-26; had Oakland recorded a touchdown on this possession, the outcome might have been very different. Reader Comments: Although replay review improves football by reducing officiating errors, nobody seems happy with the current system. Bill Barker of Lincoln, Neb., writes, "Wouldn't it make more sense to have a replay official who isn't viewing the game at all? Sitting in a central office somewhere, not even at the stadium. He could be buzzed when there is a play in question and only told what issue needs to be resolved -- not how it was called on the field. If he thinks the result of the play is clear, he says what it should be. If he can't make a clear decision either way based on what he sees, he tells the referee at the game to let the call on the field stand -- however it was called. "By removing the replay official from the game and not allowing him to know how officials on the field called the play, you remove any bias he may feel from viewing the original play, knowing the momentum of the game, hearing the home crowd reaction and from his desire not to overrule his fellow officials working the game. If he feels he can make a definitive call based solely on what he sees, he does. If he can't, the play stands. And no viewing over and over for several minutes -- a quick look and it's either obvious and he rules that way, or he tells the officials to let the call stand." Doug Pensinger/Getty Images The Denver cheer-babes got a Christmas present in Tim Tebow. I noted that for the past four years, Brett Favre's final play of the season has been an interception or a sack. Neil Kessler of Farmington, Conn., adds that Favre's final play of the 2001 season was an interception; of the 2002 season, a fumble; of the 2003 season, an interception. Thus for seven of Favre's past 10 seasons, his last play was an interception, sack or fumble. Maybe the football gods are trying to tell him something! Single Worst Closing Minutes of the Season -- So Far: Sure, the Marine Mammals are disappointed that an expected playoff season is a bust. But they couldn't hold a 10-point lead with five minutes remaining in the fourth quarter at home against Detroit, which entered the contest on a 1-26 road streak. That's just miserable. After the Lions rallied to knot the score at 27, Miami faced third-and-8 on its 22 just before the two-minute warning. Detroit middle linebacker Deandre Levy, who doesn't exactly possess blazing speed, intercepted the pass. Only the offensive linemen gave chase. Miami's speed guys just stood around watching Levy run, and, because the down began with Miami in a five-wide set, there were four speed guys on the field for the Dolphins. According to the gamebook, the play lasted 14 seconds -- very long by NFL standards -- as Levy repeatedly cut back while Miami's speed guys stood around doing nothing. And if you have a lead late and your team rushed for 154 yards on the day, why are your coaches calling passes? From the moment the Dolphins led 24-14 and took possession with seven minutes remaining to the moment Detroit led 34-27, here are the calls: run, incomplete pass, complete pass, run, incomplete pass, run, punt; run, incomplete pass, interception; incomplete pass, called pass results in scramble, interception returned for a touchdown. From the point the Dolphins reached a clock-killer situation, Miami coaches called four rushing plays and eight passing plays, the latter resulting in four incompletions (stopping the clock and keeping Detroit in the game) and two interceptions. Lazy Miami players and daffy Miami coaches -- you are guilty of the single worst final minutes of the season. So far. Next Week: The coveted "longest award in sports" -- the Tuesday Morning Quarterback Non-Quarterback Non-Running Back NFL MVP.